BEACON FALLS — Republican state Rep. Nicole Klarides-Ditria handily won re-election in the 105th House District with nearly 68 percent of the vote in Tuesday’s election. 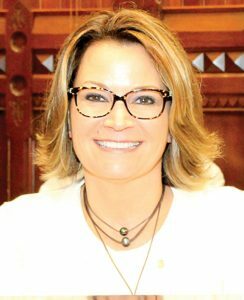 Klarides-Ditria defeated Democratic challenger Kevin McDuffie to earn her second term representing the 105th District, which covers Beacon Falls, Seymour and part of Derby. According to unofficial results, Klarides-Ditria received 7,035 votes to McDuffie’s 3,346. Klarides-Ditria, a 49-year-old Seymour resident, earned her first term in 2016 by defeating then-incumbent Democrat Theresa Conroy. She is an athletic trainer at Lauralton Hall High School in Milford. In addition, Klarides-Ditria is involved in the day-to-day operations of her family’s business, Klarides Family Associates. Klarides-Ditria said her second term will be similar to her first in that she will continue to work on budget sustainability, stopping over spending and injecting common sense into government. Correction: An earlier version of this story reported state Rep. Nicole Klarides-Ditria is the football trainer for Seymour High School. She is no longer the football trainer at Seymour High School.